Compare Indoor Child Safety Gates: Regalo, Munchkin or Summer Infant? Though it may come as news to many people, indoor accidents are the leading cause of death, disability and hospitalization of infants and children in the US. But this is not so surprising after all when you consider that a 6 to 9 months old infant can already start crawling to reach and explore surrounding objects raising the possibility of accidents. Furthermore, an 18 to 2 years old toddler is already able to climb stairs at least by crawling. During that period the child can be restless and non-cooperative and may often try to violate prohibitions and warnings to imitate adults. This is quite a dangerous period as far as home accident risks are concerned, and the risk of an accident happening grows as the toddler grows and is able to walk, run and go up and down stairs. To avoid indoor accidents it is strongly recommended to use safety gates at the top of staircases and at the entrance of rooms with risky contents. This article will describe and compare the three most popular indoor security gates that have been bought by Amazon customers. They are the Regalo, Munchkin and Summer Infant safety gates. Not only were these three brands best sellers at the time this article was written, but they have also received excellent reviews from Amazon customers (an average rating of 4 stars out of 5 for Regalo, 4 stars out of 5 for Munchkin, and 4.5 stars out of 5 for Summer Infant). All three gates can be either pressure mounted or hardware mounted. Pressure-mounted gates do not require making any holes or using any screws. They stay in place simply by pressing on the opposing walls on each side of the gate. But this type of mounting should only be used between adjoining rooms or at the bottom of stairs where there is no falling risk. 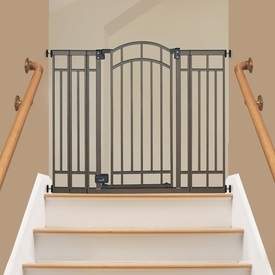 Pressure-mounted safety gates are not secure enough to use at the top of stairs. At the top of stairs, you should always use hardware mounting which require drilling holes and bolting the gate to the framing inside the walls. When you buy these security gates, all that is required both for pressure mounting and hardware mounting is provided. Whether you use pressure or hardware mounting, you should always look for a safety gate that is certified by the Juvenile Products Manufacturers Association (JPMA). All three safety gates can be used on doorways. For doorways between adjacent rooms pressure mount is sufficient. For all three gates, for installation at the top of stairways only hardware mount should be used as described in the products user guide. All parts needed for hardware mount are included in the purchase of these gates. The Regalo safety gate can fit openings between 29-1/2 and 34 inches wide. This gate also includes a 6-inch extension kit to accommodate openings up to 40 inches. Plus, you can use two additional extension kits (sold separately) to accommodate wider spaces if necessary. The Munchkin gate can accommodate openings from 29-1/2 to 35 inches wide. The gate comes with one 2-3/4-inch extension. The gate can also extend up to 54 inches wide with the addition of 5-1/2-inch and 11-inch extensions, which are available separately. The Summer Infant gate is adjustable to fit openings from 28" to 48" wide using the included two 4-1/2-inch extensions and one 9-inch extension. Regalo offers two different safety gates with the only difference being the height. One is 31 inches high, the other 41 inches. Both products can be found in the Amazon section below. The Regalo gate only opens in one direction. You can choose which direction it will open by the way you install the gate. The Munchkin gate swings open in both directions, but you can also choose to use an optional third lock at the base of the gate to control the direction that the gate opens. It allows you to set the door to open in either direction or locks it both ways to prevent it from opening at all. On the Summer Infant gate, there is a little plastic piece (auto-stopper) that prevents the door from swinging in both directions over the stairs. This can be removed when using the gate between adjacent rooms to allow the door to open in either direction. Though the distance between the bars for all three gates is more or less around 2 inches, on the Regalo gate, close to the walls on both sides, at the bottom and at the top of the bars, there is a wider gap of about 4 inches (see photo of Regalo gate above). Similarly, on the Summer Infant gate at the bottom and the top of the bars the gap is close to 4 inches (see photo of Summer Infant gate above). All three gates can be either pressure mounted or hardware mounted. Pressure-mounted gates do not require making any holes or using any screws. They stay in place simply by pressing on the opposing walls on each side of the gate. But this type of mounting should only be used between adjoining rooms or at the bottom of stairs where there is no falling risk. Pressure-mounted safety gates are not secure enough to use at the top of stairs. At the top of stairs, you should always use hardware mounting which require drilling holes and bolting the gate to the framing inside the walls. When you buy these security gates, all that is required both for pressure mounting and hardware mounting is provided. On the Regalo gate, the convenient design allows adults to walk through with a simple lift of the lever-style handle. It offers a safety lock one-touch release that's easy for adults to operate, but impossible for babies and toddlers. The Munchkin gate is equipped with a double-lock handle that shuts and locks with a simple push. On the Summer Infant gate, when you let go the gate's door, it automatically closes and auto-locks the door. To open, you just need push the release button away from the handle and pull up. JPMA = Juvenile Products Manufacturers Association. Whether you choose a hardware mounted or pressure mounted safety gate, you should always look for one that's certified by the JPMA. With the purchase of a Regalo gate you get in the box the Regalo gate, an instruction manual, one 6-inch extension kit, and all accessories for both pressure and hardware mounting. With the purchase of a Munchkin gate you get in the box the Munchkin gate, a 2-3/4-inch extension, accessory kit for both pressure and hardware mounting, and an instruction manual. With the purchase of a Summer Infant gate you get in the box the Summer Infant gate, a 9-inch extension, two 4-1/2-inch extensions, tension bolts, all accessories required for both pressure and hardware mounting, a pressure mounting adjustable wrench, and an instruction manual. All prices are Amazon prices and may change at any time. For exact actual prices, please refer to the Amazon products section below. Note also that Amazon often provides a good discount on the List Price of sold products. If a discount is available, the List Price and the actual Amazon price will be shown when you click the product images in the Amazon section below. As a final note we should point out that Summer Infant is the most decorative and attractive looking of the three gates considered here. It is the only one offered in two colors: bronze and beige. You will find below official company videos illustrating various aspects of the Regalo, Munchkin and Summer Infant gates. Note that all three gates are offered and can be purchased in the Amazon products sections following the videos. So Which Safety Gate Should You Get? If you need a gate that is wider than 48 inches, you should definitely get a Regalo or a Munchkin. Additional extensions are available for these two gates to make them larger than the width that can be achieved with the extensions that come in the box. 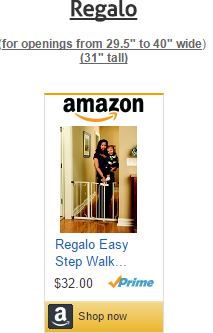 Additional extensions for the Regalo and Munchkin gates are offered below in the Amazon section. Summer Infant does not offer additional extensions. It already comes with a number of extensions in the box, but the maximum width that can be achieved with these included extensions is 48 inches. If you are looking for a more decorative and stylish security gate and you don't need to cover a width of more than 48 inches, then you should definitely go for the Summer Infant which is very attractive. Have you not found what you were looking for?